I’m so excited to be here, promoting my novella “When Fate Falls Short” with Dreamspinner Press! I’ve never been involved in the promotion side of things before so this has been just as nerve-wracking as it has been exciting. 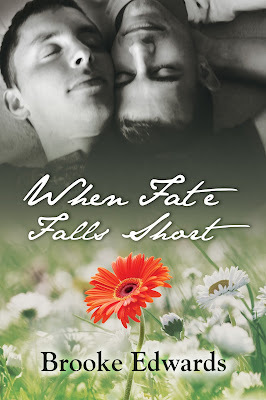 Rather than going into detail about the long, convoluted process that was writing “When Fate Falls Short” I will just say that it was an absolute labor of love. For such a comparatively short story, it took an incredibly long time to come together. Instead of a plot, I started with the characters. Sean and Nathan’s story spilled out onto the page like someone was dictating it to me bit by bit. I didn’t know where it was going yet and when tragedy struck, I felt a little like I’d been hit by a speeding car as well. I had to put it aside for a few months after that because I was so stuck in Sean’s grief that I didn’t know where to take it from there. The idea of Jesse was only a vaguely-formed shadow somewhere in the back of my mind until I came back to the story after looking at the criteria for Bittersweet Dreams submissions. It became apparent as soon as I started writing again that Sean had some tough lessons to learn, as did Jesse, and that their ending wasn’t going to be a traditionally happy one. I am so glad that Dreamspinner have a line like Bittersweet Dreams that acknowledges and even celebrates that there’s a painful kind of beauty in the endings that don’t fit in the HEA pigeonhole. For a writer like me, someone who thrives on pushing characters to the very brink to see what they’re really made of, it allows so much more freedom than the traditional romance genre. Don’t get me wrong, it can’t be all angst all the time and I’m a sucker for the fluffy happy endings too but the ones that leave you hanging, getting lost in all the possibilities and ways it could go – those are my favorites. Regardless of how it ends, love is one of those things that people will never stop writing and reading about. Most people spend their whole lives searching for a love like the one Sean loses in this story and, even though most of those losses won’t be quite so tragic or compounded by a mess like the one he found himself in with Jesse, lost loves are one of those inescapable rites of passage. Whether it was a first love, a soul mate or anything in between, what love of yours pops into your head when you think about what might have been? I’m offering a $5 DSP credit to a randomly selected winner from the comments, and as a sign-off, here’s an exclusive excerpt for you all! Sean’s never felt jealousy like he does when Erin Cartwright materializes out of nowhere in the middle of the school year and hits it off with Nathan like no one’s business. Sean bursts into the Maxwells’ entryway in late May, almost beside himself. By the time he reaches the living room, he can see Nathan sitting on the sofa with Tania perched beside him, wielding an ice pack and a wad of bloodied tissues like weapons. He can’t see Nathan’s face, but Tania looks disgruntled enough that it calms Sean down just a little. Nathan’s decidedly swollen eye, split lip, and bloodied mouth have the opposite effect when he turns his head enough for Sean to see. Nathan stares at him out of his one clear eye. “What do you think?” he asks, but his bottom lip is so swollen and cut up that it comes out more like a slurred wadyuthi that he immediately winces after. “Hey,” Nate says and reaches out to catch Sean’s shaking hand with one of his own. He shakes his head. “Nothin’ t’do w’you,” he says around a lopsided, painful smirk. “I think you two have some talking to do.” Tania dumps the ice pack and wad of tissues next to Nathan as she stands up. She presses a kiss to each of their foreheads before leaving the room. Nathan’s response is lost to his swollen lip, but Sean gets the gist. Don't forget to leave a comment below for your chance to win! I have to be in the right mood to read a bittersweet story, but When Fate Sells short sounds intriguing.